I guess I have a bird theme going here. 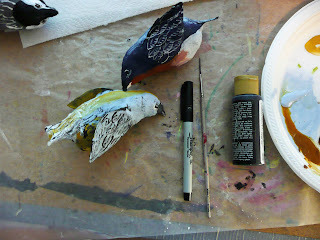 These are some cute paper mache birds we made recently. 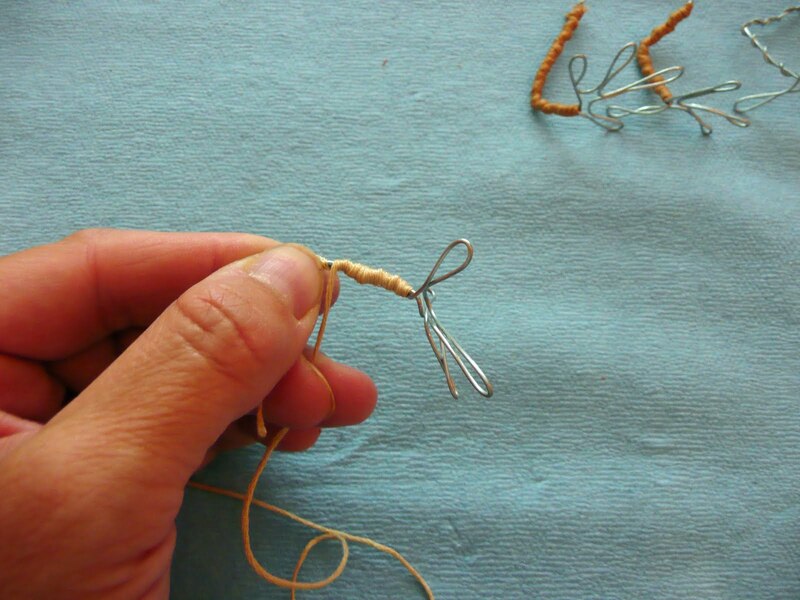 They have wire feet which allow you to clamp them on an edge like a flowerpot or piece of driftwood or have them free standing. Take a quarter sheet of newspaper and crush into a pear shape. Tape into place. You can twist out a beak shape, click on this photo to enlarge to see this. Cut some paper towel into strips about 1/2 an inch wide or so. Pour some white school glue into a recycled container and add water in a 1 to 1 ratio. Mix well. 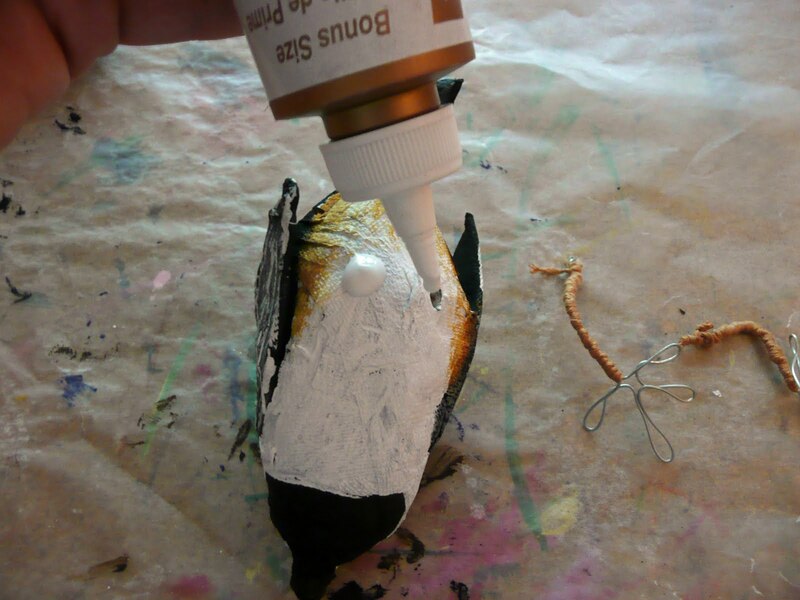 Dip the strips into the glue mixture and start covering your bird. With paper mache you want to overlap your strips for strength and smooth them down as you go. 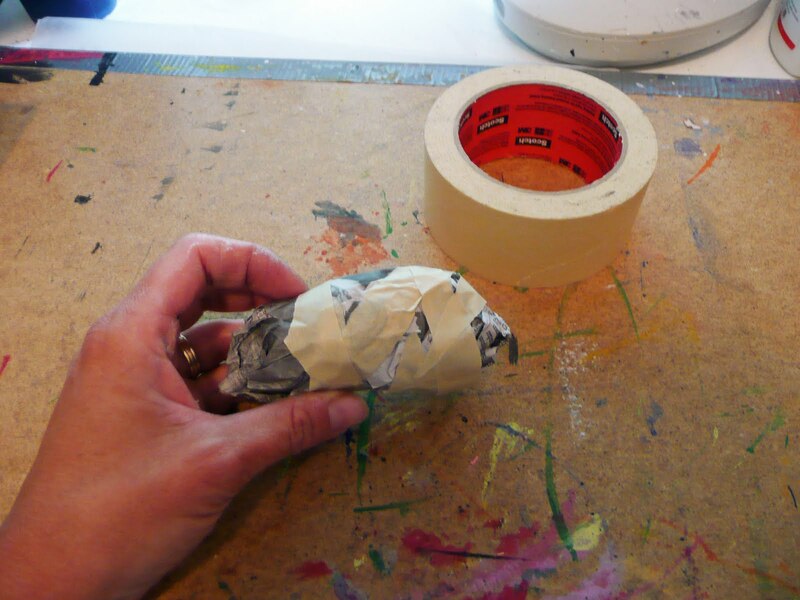 Use a few dry strips to soak up excess glue. That way your bird will take less time to dry you just want it moist not sopping. Leave to dry in a warm place overnight...turn once to ensure even drying. Out of thin cardboard from a cereal or cracker box cut out a wing shape...I used a teardrop shape. Cut out a tail shape as well. Take the cardboard shapes and cover in a coat of paper mache. 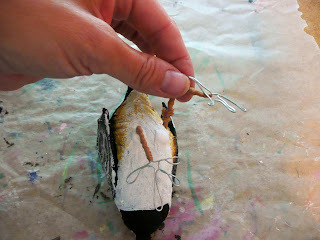 Once they are covered attach to the bird with overlapping strips. While the shapes are moist you can curl your wings if you wish. Paint with acrylic or tempera. We used a basecoat first and then added additional color on top. For the feather and eye detail you can either paint it in with a fine paintbrush or use fine sharpies after the paint has dried. Younger kids to better with the markers. 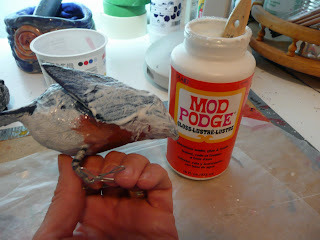 If you want a shiny coat you can add a coat of mod podge but you might want to wait until after you add the legs. This way it can stand up while drying. 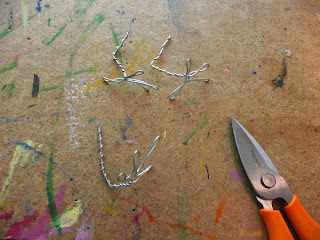 To make the feet take piece of wire about 16 inches or so. I don't what gauge this wire is as the label was missing but it's soft enough to bend with your fingers but firm enough to hold the shape without collapsing. 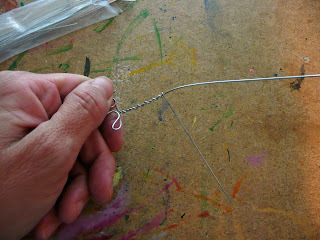 Make a foot shape with 4 toes and then twist the 2 ends of the wire together to form the leg. I like the look of the silver foot but I wanted to add some color to the legs so we wrapped them with embroidery thread. You could also use yarn. Take the end of the thread and loosely wrap from the top of the leg down, double back and wrap tightly now. When you reach the top knot off. Using an awl or a knitting needle punch holes for the legs. Put some tacky glue on them. Push the leg thru the glue into the hole (remember the knees are backwards). Add some more glue if needed. Here is the one my 7yr old made. That's it.They look pretty realistic once the legs are on. For those of you wondering where all the links went from my sidebar I finally had time to compile some pages and they are available at the top under my banner. I now see all the gaps I need to fill so I hope to add many more lessons/projects. um wow. these are so great. 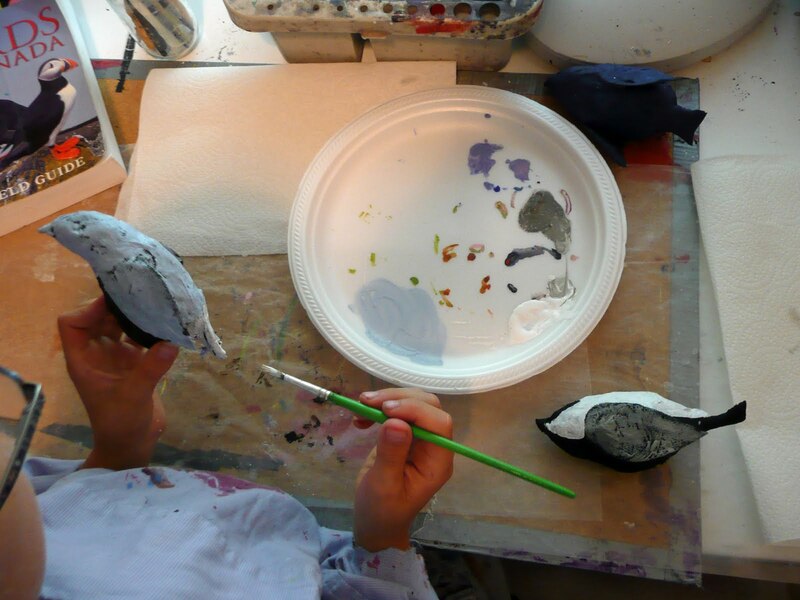 I can't believe your seven year old made such a realistic bird! that's so great. always looking for art projects to do with the girls. thanks so much! They are so cute! Kudos to your 7-year-old. 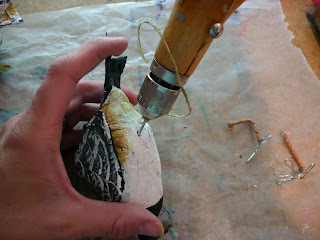 I love papier mache! 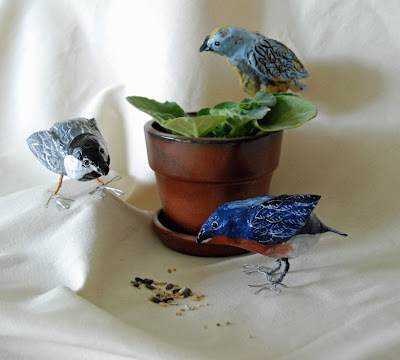 Love your sweet birds - I am going to have to try this one for sure! Great directions as well! The little birds are so pretty! I really want to make these with my children. Thank you so much for sharing this. OMG - ADORABLE!! I am going to try with my 7yo too. Thank you. I just found your blog through It's a Creative Journey...I love it! You are one talented woman! 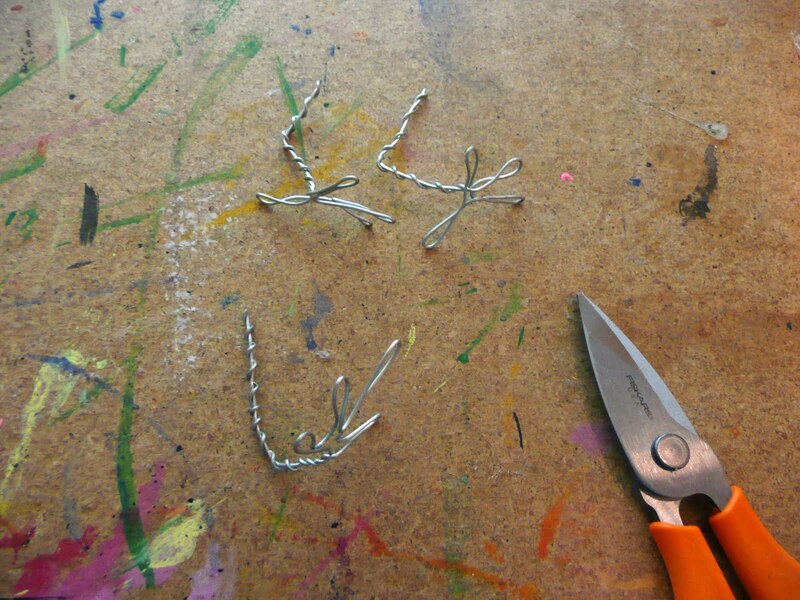 I am with a bit of fear and trembling thinking of attempting these tiny treasures! Very neat!!! We are going to have to try this one. These are wonderful!! Thank you for such a great step by step tutorial. This is a must for me to try!! Beautiful birds... I will have to try that. 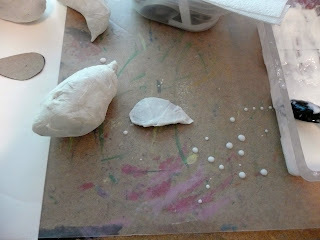 I had bad experiences with paper mache in the past but your method looks easy enough and "clean" enough for me to try. WOW - these are so cool. I love them!! SO beautiful and delicate. I'd love to make these some time, thanks. How old were the kids? amazing! i've been wanting 2 try this with my homeschool girls but didn't have a tutorial until now - THANK YOU! love this! we recently tried paper mache pumpkins, but its proven to be too large of a task for me and the kids. maybe we'll scale it down and try it the way you did the birds. and then we'll make birds! i love paper mache. thanks, as always, for the inspiration and fabulous projects. These are so beautiful, I can't wait to try them! You make it all seem so easy, thank you! So cute! Want to make a bunch for a new Christmas tree we acquired! Thanks for the tutorial! Fabulous Tutorial! Thanks so much for sharing this. I love these, Gail. Your tutorials always inspire me. Always! Well it is pretty obvious this one is a huge hit! Your little birds are a delight and as much as i dislike working with papier mache, I am totally tempted! How delightful! I love your 7yr olds bird- I feel I want to pick it up. This would be a great activity to share in one of my nature based art classes based on my book character-Lucy the bird keeper. We have a bird theme going on here too, so I will be adding these to our making list! I just saw something like this on a larger scale and wondered to myself how it was done- now I know! 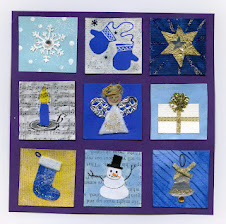 Thanks for sharing- you always have so many new, fun idea's! these are fantastic!! Ive bookmarked this one. These little birds are wonderful, Your son has the art bug. Wow, 30 comments Thanks guys! I am so pleased you enjoyed these birds as much as we do. 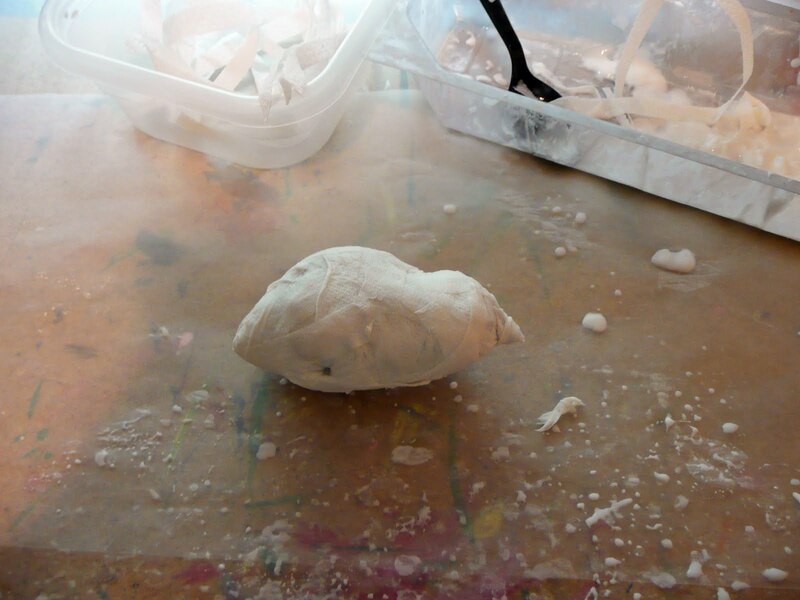 I would paper mache at school everyday if I could. It always is a favorite for the kids and the results have lots of admirers! You have such great projects! I must ask though, how big is your budget and on average how many students do you have in each class? I don't know the exact $ of my budget as I share with the other teachers for each grade, we just try to find the funds depending on what projects we are doing. 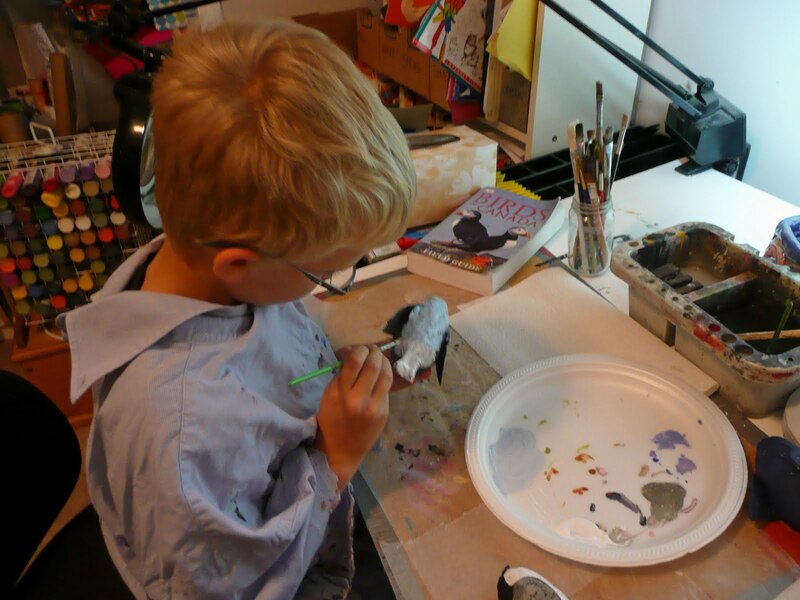 We have a standard set of supplies, paper, paint, pastels etc., and each year I try to get something extra be that watercolor pencils, glazes for clay, chalk pastels. I use as much recycled material as I can and the parents help me out with that. All fabric, yarn, embellishments..tend to be donated. I'm constantly scoping out the Dollar store and garage sales, the staff at Home Depot know me by name and I collect mistint paint, lumber scraps or whatever else they may be looking to discard. This particular project is on the cheap, paper towels that we already have, glue& paint from the supply closet and recycled cereal boxes. Class size varies with grade. 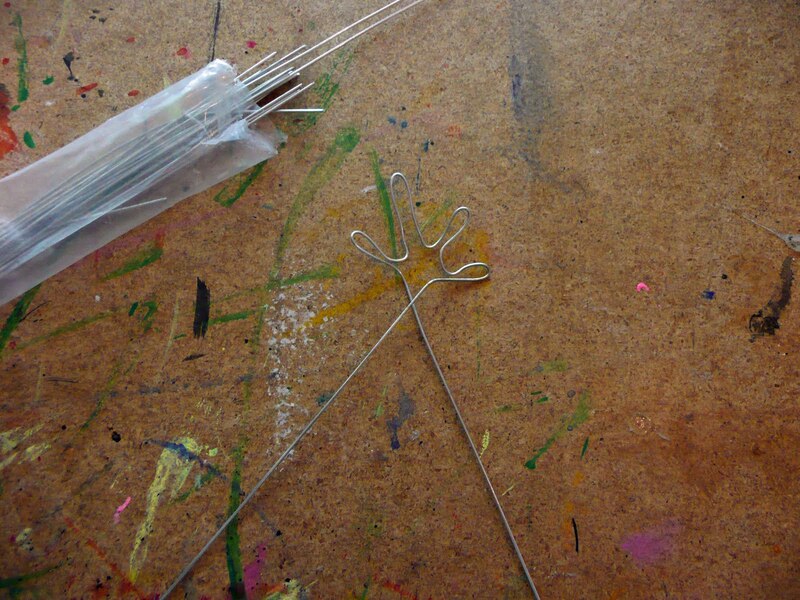 I tend to work in smaller groups (5-10) with the younger grades(k-3) or with more complicated projects. I only do clay with a full class at Grade 4 otherwise I have groups of 10 or less. Beautiful! I posted about it on my blog. You are so creative. These little birds made me smile! 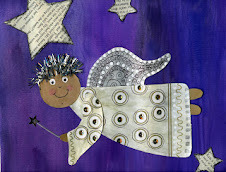 Just found your site from Whip up - what a lovely tutorial - I'll be back! 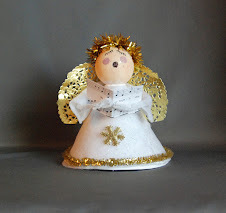 Hi :D I featured your tutorial at my Festival of Frugal Crafts. You are the best!!! Your directions are amazing, soooo clear!! Thank you for sharing!!! These are awesome!!! Thank you for sharing the how to. Hi, these are AMAZING! One quick question though - when I was a kid we used to use newspaper and wallpaper to do papier mache, is that not good....? 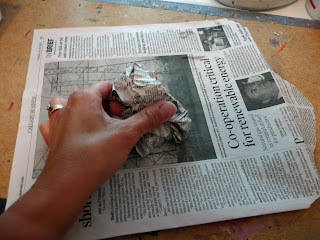 You can still use newspaper and wallpaper paste to do paper mache, I like the paper towel/glue method as it is stronger and the towel is easier to paint over. Gail, Wow! I'm so glad the gals at Rhinestone Beagle sent me your way! I tried a little upcycle project last week with some of those plastic Easter eggs and felt -- trying to turn them in to birds. They came out pretty cute, but I couldn't get them to stand up. 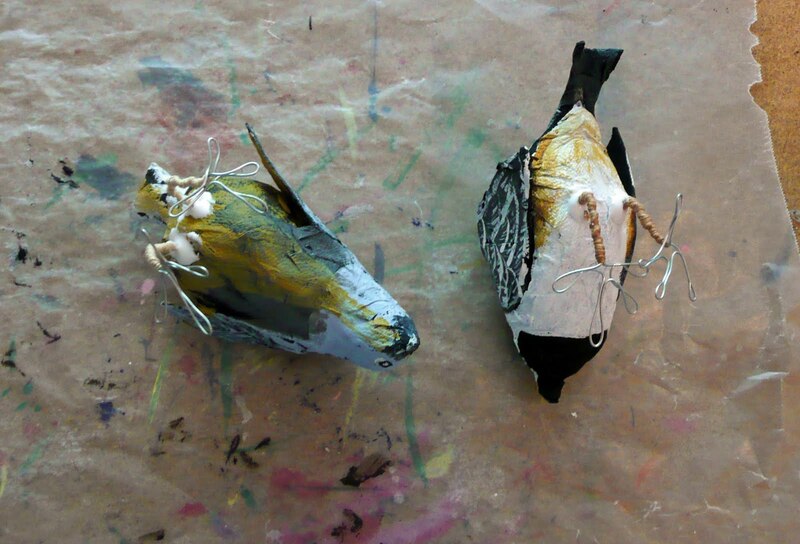 So, when I saw that Kelly & Anita had been inspired by your papier mache birds, I figured I had to stop by to learn your trick for making the birds stand. 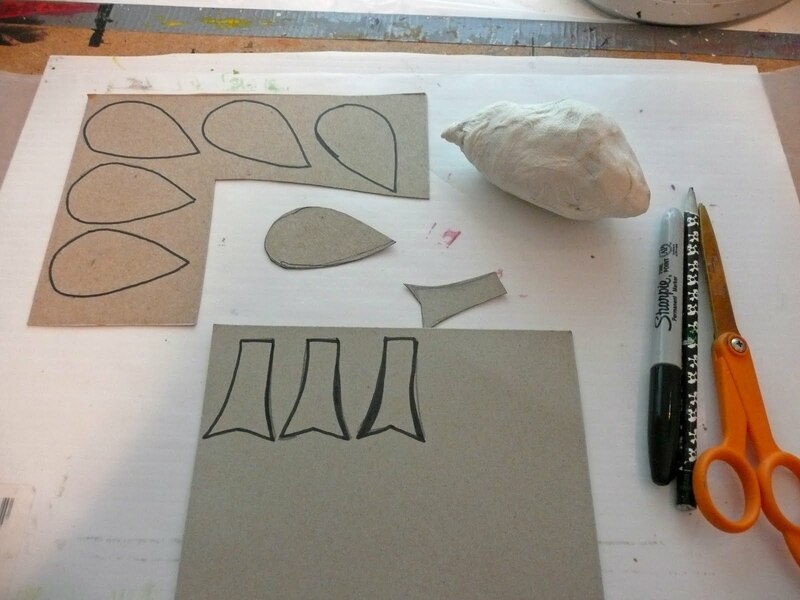 But now that I've read your wonderful tutorial, I'm thinkin', "forgot the felt birds!" I'm looking forward to trying your project with my girls! Thank you so much for the inspiration and great tutorial! Love this. Thanks so much for the tutorial! I couldn't quite remember the paper mache process and luckily stumbled upon your site while trying to plan a way to tackle my daughter's first school project. First grade and we're doing a rainforest bird. So thankful for this!!! Just found your site and love it! Thank you!! Your interests are so similar to mine as far as what type of projects are worth my time! This is so great! Thanks!! Amazing! Kids can do amazing thing! My 13-year-old daughter makes 3D-Origami birds. If anyone wants to check them out, she has an etsy shop (http://www.etsy.com/shop/Birdigami). Thanks for visiting it. What a terrific tutorial! 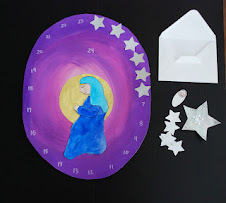 I can't wait to make a few of these and paint them with my 4YO daughter. Thanks so much!! Lovely tutorial. 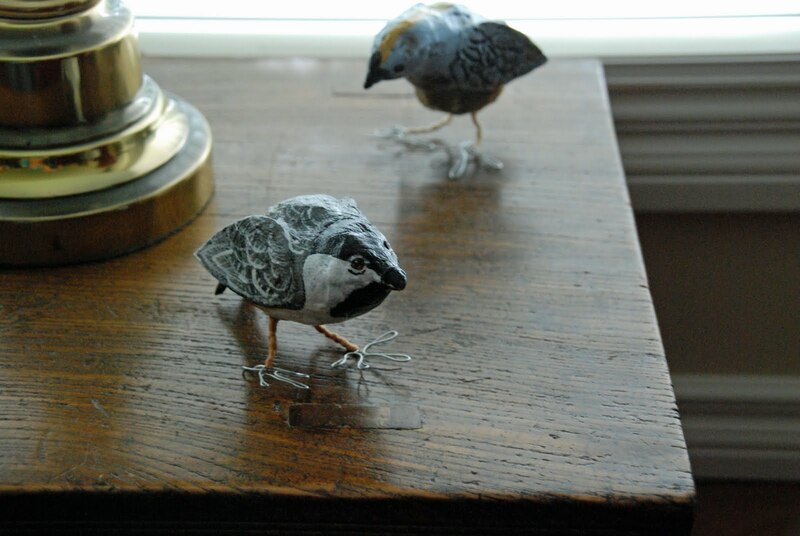 I used to make birds like these when I was a kid --- paper mache rocks. I am going to try this lesson with the Assisted Living folks. Thanks! I would like to post your bird tutorial on my Pinterest - is that allowed?? 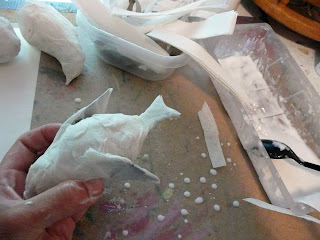 I want to get into paper mache and need some inspiration! There are lots of my projects all over Pinterest, that's fine. Good luck with your papier mache adventure! Thanks for the great tutorial, I've been wanting to make paper birds for a while. Love that all the materials are easy to find. Can't wait to try! What a great project. Thank you for all of the step by step clear photos. I think I could do this with my Grade 6 class.